Húsavík Guesthouse is a friendly guesthouse built in 1947 and renovated in 2009. The guesthouse is open from April 10th to September 10th every year. The guesthouse is located in the beautiful town of Húsavík, in the north of Iceland. In the past ten years, Húsavík has become the most popular place for whale watching in Iceland, as well as one of the most popular in Europe. Húsavík Guesthouse is a great place to stay if you are going whale watching or sightseeing in the north of Iceland. 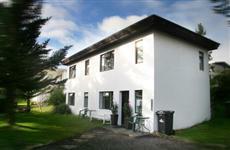 Húsavík Guesthouse is a family-run guesthouse where you will enjoy a warm welcome. In the guesthouse we have 7 rooms with the total of 14 beds. Breakfast is included in all of our prices and access to wireless internet. Húsavík is located in the north of Iceland. You can get there by air from Reykajvík to Akureyri and then take a bus for 50 minutes to Húsavík. You can also get there by bus from all over Iceland. The guesthouse is located in just a five-minutes walking distance from Húsavík harbour, so if you are going whale watching, this is a great location.